40 years is a generation according to the Bible. 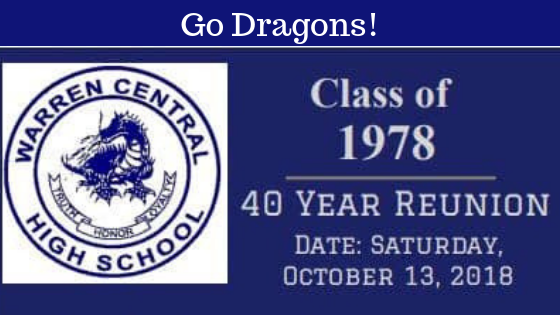 When I took a look at my fellow graduates of 40 years ago it is obvious that we have become a different generation. In 1978 we were sporting bell bottoms on slender frames and big hair we and now are trying to cope with bulges and hair issues with tasteful clothing and a good salon. I think we all had our circle of friends in high school and last night I spoke with several people I knew but didn’t have much actual contact with back in the day. Now, I wished I had known them better because they have turned out to be really fine people and it is an honor to call them classmates. In the movie “Looking for Private Ryan” the line that hits you hard is “Earn it”. When I consider the lives of my classmates, I see a group of people who have definitely “earned it” in life and though none of us are probably perfect, we are definitely deserving of the title good citizens and contributors to the fabric of a healthy American society. It was fitting to have the reunion in that old Alvaton School Gym too. It helped remind us of a time when we ate lunch, had study hall or gym in the old gym at Warren Central High School. People getting out the smart phones to take pictures, collect phone numbers and having a reunion photo done by a drone flying inside the gym’s space reminded me of a time before the personal computer, the answering machine, and the cellular devices that now dominate our existence. It was a time of vinyl Long Play records with full sized pictures and song texts and the onset of the 8 Track player. In those days music was played by musicians and not by computers and beat tracks. The dominant force in music was Rock n Roll, country wasn’t even a close second, and the bands of that era were creating some epic anthems that will endure the test of time, because they are actually really great. I think because of those years, we realized that our lives had to be lived on their own merits and that falling on the sword for anyone from above us wasn’t going to provide us with a mission in life. In fact, it seemed like authority figures were doing all they could to suppress the creativity and initiative of a new generation. So now when I look back from the distant perch of my present situation, my perspective of it is that pride in a cause, in a high school, or in a nation was not a part of our make-up but rather it was about who we were going to become as people. When I take a look at my life and consider my high school career all I remember thinking back then was that I couldn’t wait to get out of school. My mind was completely elsewhere. The social aspects of high school were almost completely meaningless to me outside my immediate circle of friends. My mind was already out the door. I remember sitting in classes and looking out the windows in early spring at the newly sprouted leaves on the trees to see if there was a wind blowing and if it would be a good day to go sailing. I used to think about the bright sun pouring in those windows and all of that solar energy just going to waste on parking lots and building roofs. I would doodle album covers or try to think of topics for songs I might write. I would think of just about anything except about the class at hand or about anything going on inside the school. I’ll be the first to admit that my apathy for high school was due to my lack of participation in it. About the only thing I remember participating in was the unsanctioned newspaper called “The Central Spirit” which was quite a fun project for me and a lot of work! In my senior year of high school I had only 4 classes so I was done by lunch time. On the first day of school in January 1978, after Christmas break, it started snowing and didn’t stop. School was closed by 12 and a couple friends of mine and I marched into the principle’s office and decided to leave high school then and there because we already had accumulated enough credits to graduate. I started working full time and enjoyed the semester being out of school very much. I was not prepared for college and it took me several years to get focused on my life’s work which would be in music. In a way, I think that there is some sort of conscious avoidance of the art of being a student in America. School seemed to be all about everything else but that and none of us really knew why we had to go through it. It is amazing anything gets done. Many of my classmates are retired already after having worked in a profession or field for a very long time. Some of us are looking for a new mission in life and others are carrying on the very important work of being grandparents. But, I would have to say that all of them have lived good lives and have worked really hard to be the best people that they could become. To me, that is deserves all of the credit and admiration in the world. What will the 50th Reunion look like? That is the million dollar question for all of us. I hope we all come together again to celebrate another 10 years of life!